Provides coverage up to 60' in diameter. Adjustable screw diffuses the water from stream to spray. 43" expandable metal tri-pod base. Provides coverage up to 60' in diameter. Adjustable screw diffuses the water from stream to spray. 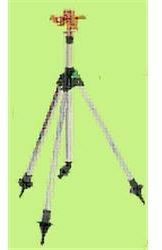 43" expandable metal tri-pod base.